HOPEFULLY everyone has had a great start to 2011. Christmas seemed like yesterday, and here it is already March. MAURICE Barwick began his farming career at the age of nine. Then, as now, it was a great success. “Dad gave me nine acres at ‘Merriworth’ in Tea Tree to plant my first crop of peas,” Maurice recalls of the time half a century ago. “They were grey peas for pigeon fanciers. 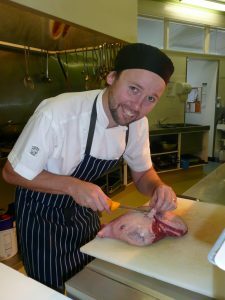 I sold them, with Dad’s help, for an incredible 700 pounds.” That was as much as some farm workers then earned in a year. 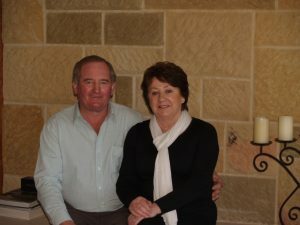 Maurice with his wife Peggy in front of their beautiful sandstone fireplace. BEING the last year for our junior under 12 kids we thought we would do something special so they would take this experience away with them and have something to show for it other than trophies or medals. We wanted to make them look professional and proud of their achievements and we came up with the idea of a team jacket. 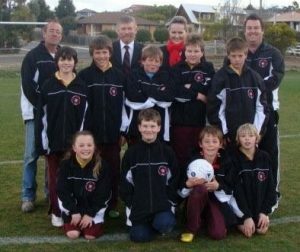 The under-12 team proudly wearing their jackets.